Leave it to the fine folks at Exxon Mobile to sponsor the absolute worst Christmas Special of the year. The Valdez oil spill was more cheerful, colorful and entertaining...and far less embarrassing. 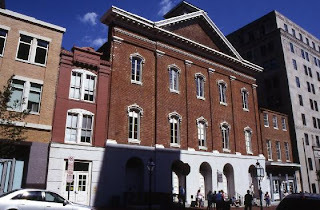 Videotaped at Ford's Theatre in Washington, DC, this ABC Christmas Special almost defies description. Joining President Bush and First Lady Laura was an audience of un-subpoenaed administration officials who clearly would have preferred spending the night with Scooter rather than Santa. The on-stage performances were so atrocious that their mortified facial expressions were reminiscent of someone learning their dog had been shot. And speaking of shots, where was John Wilkes Booth when we needed him? Among those taking the stage on this night of infamy were Wynonna, who sang a song so ill-conceived it made Thalidomide seem cheerful, comedian (and I use that word with reservation) Christopher Titus, whose "jokes" were so terribly testy he will be forevermore known simply as Elephantitus, and singer Jon Secada sounding like a cicada in heat. And as for poor Olivia Newton, her career is now firmly in the john. There should be no surprise. While the wholesome music of young Olivia was refreshing, recent efforts were clearly more tantalizing for the lowest African mercenary looking for an change of scenery only to be left preferring a battlefield with unsurmountable odds to toneless blase effort.